You need to focus on something, but there’s too much distraction and noise all around, breaking your focus in the process and hindering your thinking. Of course, putting on a pair of headphones and drowning out the unwanted sound with some music can get the job done. However, noise can sometimes continue to creep in – so now you have to contend with those disturbances as you’re trying to enjoy the music. Well folks, the good people over at Velodyne are aiming to mute those distractions entirely with its vQuiet headphones. Utilizing the same exact design language as other recent Velodyne headphones, one that flaunts an inverted teardrop design, which comes from the brain of international artist and Velodyne President, Martha Hall, we wouldn’t necessarily proclaim it to be a fresh or original design at this point. Nonetheless, we’re just glad to see that its build quality isn’t wonky like the vLeve headphones. Rather, this plastic framed pair of headphones has a sturdier build quality – further complemented by its clean matte black finish exterior. Putting on the vQuiet over our head, the fluffy cushioned padding around the ear cups and headband deliver an astoundingly comfortable feel. In fact, we have few qualms about its confort, seeing that it continues to feel natural and cozy over long periods of time. However, we should point out that we’re allowed to only adjust the length of the ear cups, but those ear cups can’t twist to further enhance the feel. Indeed, the vLeve doesn’t try to attempt to hide its massive size, but it’s nice it collapses for a more travel-friendly size. Looking closely at each ear cup, they bear their own set of ports and buttons. Starting with the left pair, there’s a physical on/off switch that controls its noise cancelling property – while the right pair has a microUSB port to charge its internal battery (used for the noise cancelling feature) and an LED light to indicate its charging status. Interestingly, there are 3.5mm headset ports that are found on both ear cups. Not only can we choose what port to use to connect to our device, but the other one can also be used to daisy chain to another pair of headphones – allowing a friend listen in to what you’re listening. Giving it some serious firepower, the Velodyne vQuiet features 40mm drivers, frequency response of 20 Hz - 20 kHz, 105 dB/1 kHz/1 mW sensitivity, and a 90% reduction in ambient noise. Starting with the latter, we’ll say that it works well when we’re playing a song at the mid to high volume levels. In fact, background noise and disruptions are almost non-existent with this feature on, but if we’re just wearing the headphones without playing a song, we can still hear some of those unwanted sounds in the background. As for the audio performance, we have to admit that its volume is commanding – nearly deafening at the loudest setting. Having a strong bass presence is something produced astoundingly with the vQuiet, since there’s a fair amount of thump and liveliness with them. At higher volumes, though, mids tend to drown out by the stronger emphasis on those low tones. 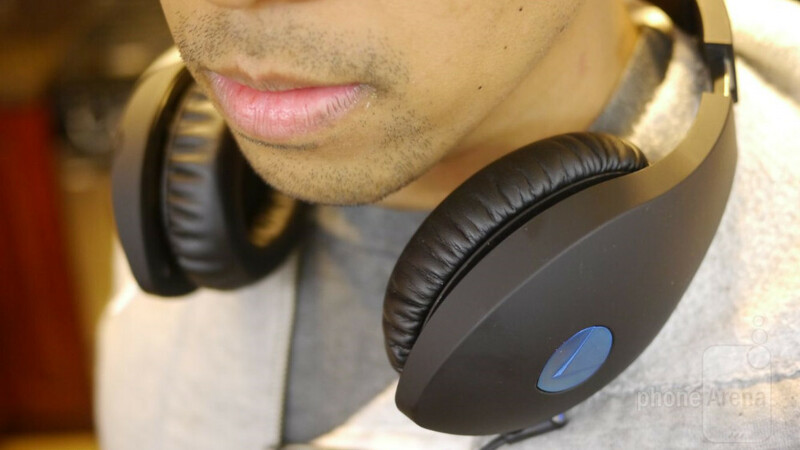 Overall, we’re pretty pleased by the headphone’s audio quality. It’s bold, rich, and robust! Sporting a price point of $299, these don’t come cheap. For the price and all, consumer would imagine this to be at least a wireless Bluetooth model, but that’s sadly not the case. Instead, what we have here is simply a wired option that entices us with its noise cancelling property. Indeed, that aspect works well as long as we’re listening to something, but things tend to get drowned out at higher volume settings.